On the corner of Ponce de Leon Boulevard and San Amaro Drive, the atmosphere at Mark Light Field is special. From the famous milkshakes to the Miami Maniac and the superstitious Mark Light Magic, the environment is invigorating. The energy stems from the screeching calls of “siéntate” after each strikeout and the lifers who have not missed a home game in decades. And of course, children and their parents filling in the lineup on their scorecards paints the stadium in a sea of orange and green. Through all the chaos and traditions at The Light, there are legends who stand out amongst the pack. But there is one man who has been making an impact at the University of Miami for more than 60 years who still flies under the radar. At first glance, Hap Pate appears to be your average staffer at the ballpark. But Pate, 87, is very different from the other employees. And the people have certainly enjoyed him. Yet, Pate’s love for UM runs much deeper than his work at baseball games. Henderson Alton Pate, better known as Hap—which he has been called for as long as he can remember—was born in the mountains of Wheeling, West Virginia in 1931. Pate played a variety of sports—including baseball, basketball and football—growing up as a kid in Roanoke, Virginia, where his family moved in 1932. And sports may in fact have saved his life. When Pate was 17-years-old, he and his friends were horsing around with a pistol. What seemed like harmless fun quickly turned into something scary. Pate’s childhood friend shot him in the side of his torso, just missing his ribs and organs. The doctor told Pate that since he was in very good shape he avoided a major scare. At the time, Pate, or as he liked to call himself, “Superman,” could do 200 sit-ups and 100 pushups. Pate graduated from high school a semester early and enlisted in the Marine Corps before transferring to the Air Force in Jan. 1951. While stationed in Tripoli, Italy, more than 4,700 miles away from his home, Pate found his true passion. He auditioned for the Armed Forces Radio Network and got airtime as a DJ to entertain the troops. Known as Hap Henderson on the air, his appetite for broadcasting continued to develop. After being discharged from the Air Force, Pate came to UM in 1954 as a radio-television-film major with a minor in sales and marketing. Yet, his connection to the Air Force remained. He was part of UM’s Air Force ROTC program and even garnered honors as a Wing Commander. 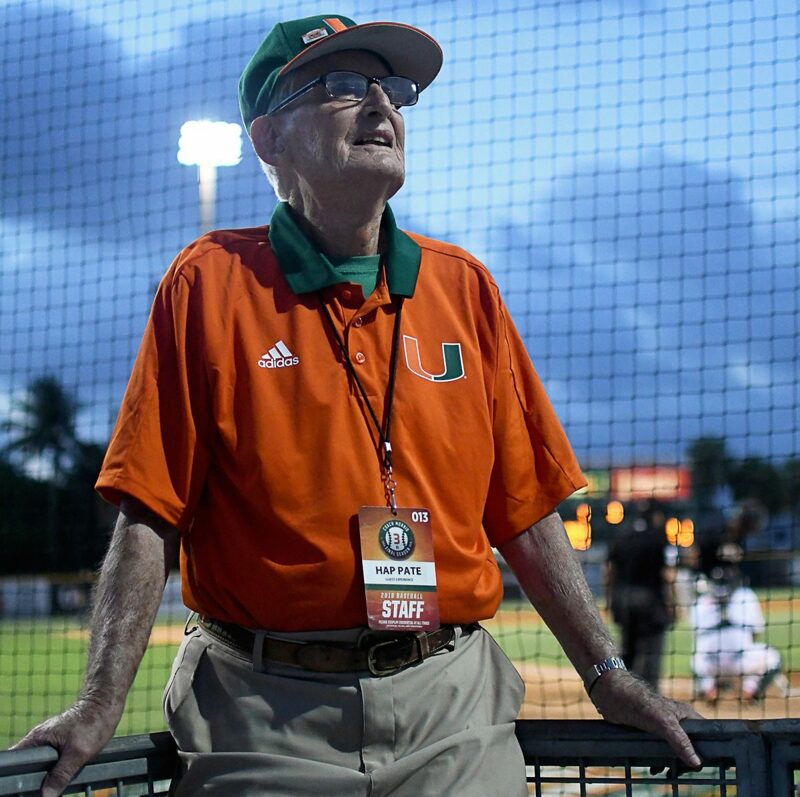 Pate helped establish Miami’s intramural program alongside Norman Whitten and Jack Kelley, while also balancing a rigorous course load and completing his 120 credits in three years instead of the standard four. He was tapped into two national communications fraternities: Alpha Epsilon Rho Honor Society and Alpha Delta Sigma Honor Society. Pate’s 3.4 GPA and involvement in extracurricular activities, including being president of the Sigma Alpha Epsilon fraternity, earned Pate an induction into the Omicron Delta Kappa National Leadership Honor Society. But academics weren’t the only reason why enrolling at UM would prove to be integral to his life. Pate, a devout Christian, attended Sunday mass at Miami. At the service, he saw a woman who would forever change his life. Pate and Nancy Chivers dated for four years before getting married on March 29, 1958. “Nancy is the love of my life,” Pate said. “She and Jesus Christ are my best friends.” He and his wife celebrated their 60th anniversary last year with a seven-day cruise. The couple has three children, seven grandchildren and four great-grandchildren. Pate climbed the corporate ladder at the station and became the sales manager before eventually being named vice president and ultimately general manager. “As a sales manager, I would tell my sales people ‘the people you call, may not want to buy your product, but they may want to buy from you. Sell yourself, not the product,” Pate said, who worked 35 years in the radio business. There has been no seventh inning stretch in Pate’s lifetime. He has worked as the official clock operator for the Miami Dolphins when they opened up the Orange Bowl, called balls and strikes at Miami Stadium for the Marlins when they were a semi-pro club and has even worked multiple Hurricanes track and field meets at Cobb Stadium over the years. Nowadays, when he is not at the ballpark, Pate is constantly reading mystery novels by John Grisham and David Baldacci. He has finished all 13 books by Baldacci and is nearing the end of his Grisham collection. During the summer and fall, Pate resides in North Carolina, a place that he said reminds him of his childhood home. 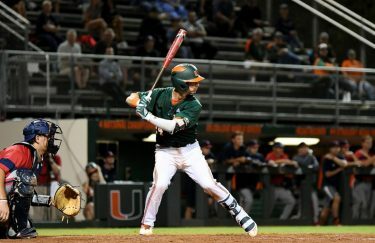 For as long as he can, Pate said he will continue to ride out his ninth inning and bring joy to the fans at Mark Light Field. “I look forward to every game. Hopefully I can do this for another 35 years,” Pate said. Pate will begin another season at his second home when the Hurricanes host the Rutgers Scarlet Knights on Feb. 15. First pitch is scheduled for 7 p.m.